Former Israeli Security Agency (ISA) head MK Avi Dichter (Likud) took a tour on Sunday morning of the Gush Etzion regional council of Judea, and spoke about the rising wave of Arab terror. 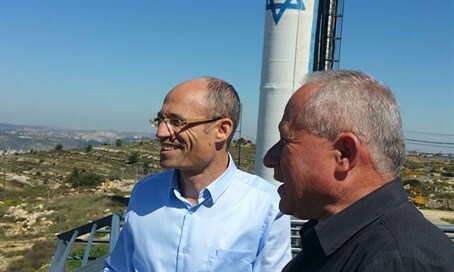 Dichter, who toured the region together with the regional head Davidi Perl, told Arutz Sheva that "even the Palestinians understand that there is no negotiation over Gush Etzion. In my many meetings throughout the world that was always clear." He said he "refuses to be drawn into the tactics," and emphasized that "we must not lose the strategic goal. We must act in order to reach a solution." "It is not realistic to think that it's possible to give citizenship to all the Palestinians," Dichter said of the Arab residents in Judea and Samaria, noting a key obstacle of those proposing an annexation of the region while offering Arab residents citizenship. "We are approaching a balance between the (Jewish and Arab) populations between the Jordan (River) and the (Mediterranean) Sea. We have to take into account that this year for the first time there are more Palestinians in Israel than in the (Palestinian) diaspora." "It is important to fight the current situation in which there are three different entities in the territories - Israel, the (Palestinian) Authority and Gaza. It would be a serious mistake to isolate Judea and Samaria from Gaza." The former ISA head said that "unfortunately in the left they don't understand the danger and are seeking this as an easier route." Turning his attention to steps that can be taken against the terror wave, he said, "you don't need to wait for difficult times in order to take serious steps. I'm not alarmed by creating difficulties for the Palestinian population." "A thousand mothers of terrorists will cry so that a single mother of ours won't cry. We too often consider the Palestinians, and do too little of what is right for us." Among the many counter-terror steps that have been raised but have yet to be implemented by the government is the expulsion of the families of terrorists, a step Dichter likely hinted at in his statements.